Before and After: Back in business with the home office. 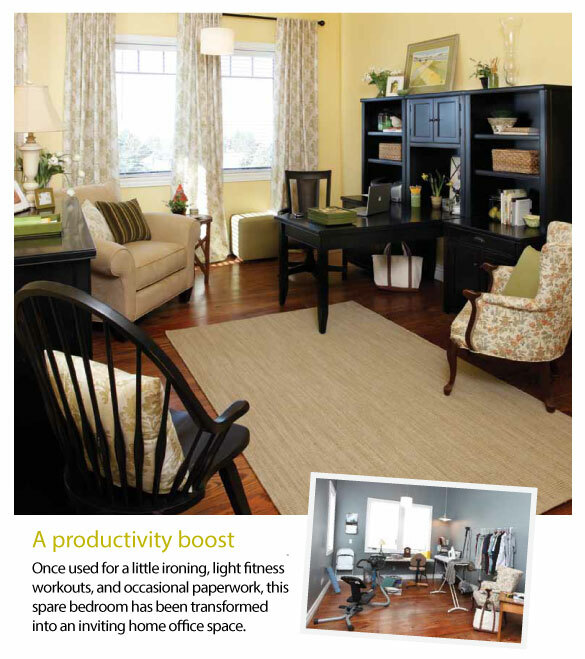 Once used for a little ironing, light fitness workouts, and occasional paperwork, this spare bedroom has been transformed into an inviting home office space. Hardworking Furniture: The desk, which can be set up in the middle or at the end of the unit, easily accommodates a computer and other technology. From cluttered catch-all to warm and workable. That’s the transformation we accomplished in converting a spare bedroom into a home office. First, we gave the room a soothing color palette that’s neither overtly masculine nor feminine. For the walls, we used Benjamin Moore’s Hawthorne Yellow and added green and cream touches that are repeated throughout the room in the chair, rug, lamp and window treatments. A floral upholstered family-heirloom chair provides a personal touch and another splash of color. Next, we selected the attractive, space- saving Tribeca Loft Hutch wall unit with its generous file drawers and adjustable shelves as the room’s stylish workhorse. A bookcase/file- cabinet offers additional storage and anchors a sitting area. Inexpensive, custom-cut faux wood blinds in white and delicately patterned curtains complete the look. Mounting the curtains above and beyond the actual dimensions of the tall, wide windows makes the high- ceilinged room feel less cavernous. • Determine your needs — storage, work surface, etc. • Measure carefully and consider the home-office layout that’s functional for you. • What colors do you need for a working environment?